Kojoney SSH honeypot, plus helpful scripts. 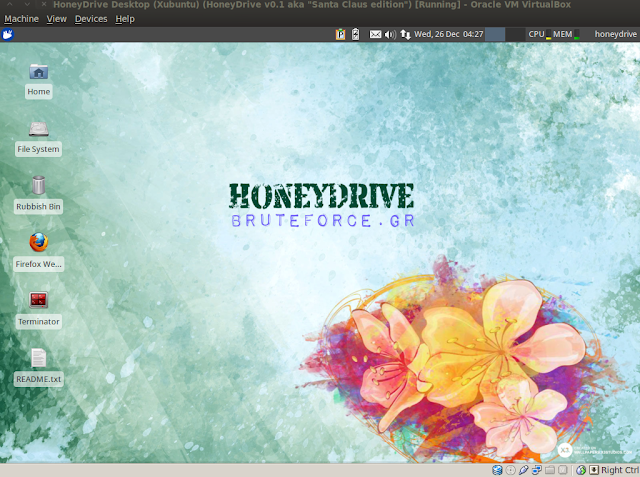 Thug honeyclient for client-side attacks analysis, along with mwcrawler malware collector. Firefox plugins pre-installed, plus extra helpful software such as GParted, Terminator, Adminer, VYM, Xpdf and more. After downloading the file, you simply have to import the virtual appliance to your virtual machine manager/hypervisor (suggested software: Oracle VM VirtualBox). If you want to use HoneyDrive in VMware products (Workstation, ESXi, etc) please read this: Setup HoneyDrive on VMware.